Third big add-on to the Endless Space 2. In Penumbra, developers from Amplitude Studios introduce a new faction (Dark Choir, whose design was created by the game community). We also get hacking mechanics and powerful technology - invisibility modules. This is Endless Space 2 expansion pack. Endless Space 2: Penumbra is the third major expansion to the 2017 4X space strategy. The add-on introduces a number of novelties and improvements to the game, including a new faction of the Dark Choir (its design was proposed by the community), as well as the mechanics of hacking and invisibility modules. Developers from Amplitude Studios are responsible for creating this title, i.e. the authors of both the basic version of the game, the previous part (released in 2012), as well as the fantasy-based production Endless Legend (2014). Endless Space 2: Penumbra introduces a number of improvements and new mechanics to the basic version of the game. First of all, players gain access to the very characteristic faction of the Dark Choir, which since the dawn of time has been wandering the cosmos and observing the misfortunes afflicting various civilizations. The Dark Choir has only one star system throughout the game - but it is well hidden (the ability to hide at all plays a very important role in the case of this faction). The second big novelty is the hacking mechanics. A player can launch a hacking operation on any of the systems he owns, targeting enemy-controlled territory. Successful completion of the action allows you to choose one of several harmful effects for the opponent. Importantly, both the attacker and the defender can use special programs to increase their chances. The last big novelty is the invisibility modules - thanks to them our ships (and even entire fleets) can unnoticeably travel through space. Invisibility has several levels of effectiveness, and the same is true of equipment that detects invisible starship - in order to stay ahead of the enemy, we will have to continue to develop our technology. 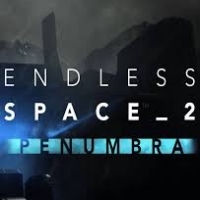 Endless Space 2: Penumbra does not add any new modes or campaigns to the game, but the new faction allows you to experience the existing content in a different way. Endless Space 2: Penumbra is a non-self-reliant add-on - it requires the basic version of Endless Space 2 to work. The extension does not introduce any changes in the audio-visual layer.